Volkswagen Canada advertises its Volksfest Clearance Event in a new hilarious ad, showcasing the all-new 2019 Jetta. 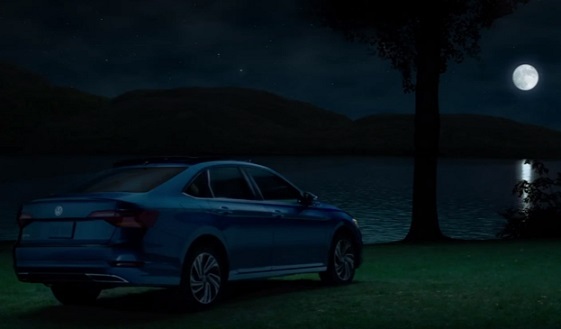 The 15-second spot opens with the image of a Jetta parked by a lake, on a night with full moon. Inside a couple is making out as if they are on their first date. Soon, though, it turns out they are actually on a camping trip with their two kids, who are staring at them as if they’re asking for explanations. The parents’ kissing session was ended by the car’s Pedestrian Monitoring system, which is the newest feature of the VW Front Assist technology. The soundtrack music is a song titled “I wanna give in to this love”, which is available to listen on Spotify, in Top 50 Romance, according to the ad. Pedestrian Monitoring uses radar technology to warn the driver of any possible pedestrians in the vehicle’s path. If the driver does not take proper action, the vehicle will automatically stop with full force of the brake. This feature keeps both distracted drivers and walkers safe and helps in split-second situations. Front Assist technology is available in every 2017 Volkswagen model but the Beetle, with the new Pedestrian Monitoring system available in the 2018 Tiguan and Atlas models. Volkfest is VW Canada’s largest sales event of the year. It begins in August and typically runs for three months through the end of October. This year, people can get incredible incentives on most 2018 models, including the Golf, Golf Sportwagen, Passat, Tiguan and more. Typically, savings also include a $1,000 bonus direct from the dealership, plus cash discounts of up to $5,000 on select 2018 models. For the “one and only” completely redesigned Jetta, with 1.4 TSI Comfortline manual transmission, there is a special lease offer from $57/weekly at 2.49% for 60 months with $1.010 down payment.